Well hello there... It’s been a while, a long while, a whole month nearly. It’s suffice to say that I’m not into the blogging groove quite yet, still on the fence about whether or not I wanna keep it up. For now, I’ll hang in there, slowly but surely, all sloth and turtle like. I have quite a bit to catch you up on. First up, greetings from the land down undah! Being here has come as a surprise, I feel like I closed my eyes in Sri Lanka and suddenly woke up in Australia. I like to remain open and have a little-to-no planning come-what-may kinda approach to travel, but ideas form and this was not at all what was in the works. Maybe Sri Lanka actually didn't happen, looking back it felt like a complete and utter dream. The absolute best kinda dream to wake up from, but the more I come to, there is no mistaking, my time there actually did happen. With pics to prove it! So beautifully balanced and full of opposites, multi-faceted yet so simple; bright, shiny, crisp and colourful and sometimes muted, heavy and light, mysterious and hazy; past the noise there was silence, always a still calm to be had amongst the chaos; new and old, sweet and so spicy, fast like a leapord and slooooow like a snail. Drool worthy vistas chugging along with every turn on the tracks. With it's many contradictions came it's multitude of dimensions, with magic being at the forefront. Butterflies by day, fireflies by starry nights, the vibrancy of absolutely everything, a kaleidoscope of green, the contagious smiles and warm hearts of all the endearing locals, the flavours awakening our taste buds, charming train rides in the sky, tea plantations on mountain slopes, private surf breaks in the turquoise waters of the Indian Ocean in soothing sunshine and tropical rains, the smell of jasmine, eucalyptus, cinnamon and incense wafting our nose wherever we went; every experience sparkled. I swear I saw a unicorn jumping over a rainbow coloured elephant and a cow flying over the lunar eclipsed full moon while waving at a turquoise shimmering sea full of dolphins, turtles and mermaids. Tasty things come in teeny tiny packages. I will (hopefully) get around to writing more about Sri Lanka. I think it may go without saying, that my lack of posting means I was fully taken aback by the present moment. My passion for travel was quickly sparked back up, being reminded of why I chose to spend this year on the road/sea spreading my wings/flippers. Her face says it all, summing up the awe we both felt during our many sunrises, sunsets, moon gazes, rotis and floaties. One things for sure, Sri Lanka was extra special exploring and being in the company with this wonderful woman. Love ya Snips! 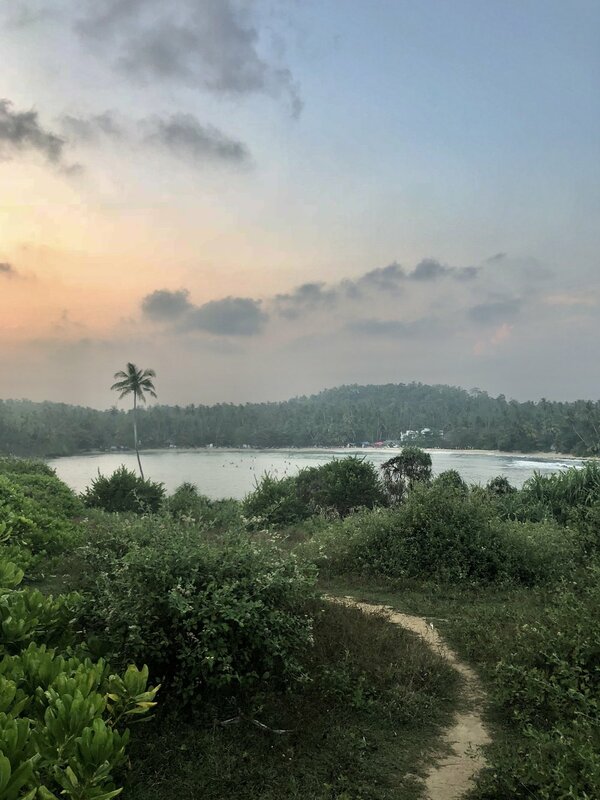 I dusted off my computer only a couple times in Sri Lanka, and when I did, it felt like the screen was pulling me out of the magic, with the tech-time mostly spent trying to get myself an Indian visa, which I was prepping to experience after a quick trip to the Maldives. I had booked 10 days at a ‘locals’ island, minus the fancy over water bungalows, hoping for time to recharge and chill before making my way to the almighty motherland. Sarah and I had originally thought of heading to the Maldives for a few days after our surf retreat to get in some diving, but we hadn't had enough time in the Pearl of the Indian Ocean (aka Sri Lanka). I couldn't shake the image of white sand beaches and atolls floating in the azure seas, so when a new surf sister stated how incredible the Maldives are and that they won’t be around much longer, I was easily convinced. I booked an AirBnb on her recommendation next to an apparent amazing wave, and not even an hour after booking, I found out that political crisis had broken out in the Maldives. A serious travel advisory had been put out which I tried to brush off, but the more I educated myself on what was going on, the more unsettled I felt about going. This made me question how conscious and morally responsible I want to be when I travel, as a human in general and as a woman on my own, as it's all too easy for me to not keep up with world issues while on the road (which certainly also has it’s advantages). I think a good little google will always do me some good. And to top it off, the Indian eVisa site was causing me much grief. Ideally I would’ve done all my visa paperwork before leaving Vancouver but when things came down to the wire, I didn’t allot enough time...No point shoulda woulda coulda-ing, so I took the technology headbutting as a sort of sign that I just ain’t ready for India quite yet. I got other things to do first. I hopped on 2 planes, by way of a 24 hour layover in Singapore spent with my adorable Vancouver neighbours, enjoying some more cloud and sun shows from the sky. Like being here in Kangaroo country! Australia seemed so easy and brainless and once the idea came to me, bing bang boom, it all happened so quick. My new Aussie gal pal whom came into my life minutes after Sarah left, inspired me, being super excited to fly home to Queensland to surprise her mom. With my Sri Lankan visa expiring the next day, I tagged along and did the same, putting my mom in happy dance mode as she is spending her winter/Aussie summer with her partner just outside Brisbane. And here I am, a week and a bit in. I’m trusting that every decision I’m making on this year off, no matter how I get to it - whether it’s in my control or out of my hands - will always be the right one. So being here with my mom is the way things are supposed to be. I’ve been appreciating how she feels like home and how comfortable I am in her company. We haven’t always seen eye to eye, typical mother-daughter fashion perhaps(? ), but as we both grow older, I see how precious our time is. All past woes and worries seem to not matter anymore and we’ve been getting along rather well, maybe better than ever(!). My time here is quickly taking shape, and I’m currently on a bus to Byron Bay, where I’ve been told by many that I’m going to love and may never want to leave...but alas, I already have solid plans to leave with a flight booked to Darwin next week. I have a few more ideas of what’s to come next, which I’m reluctant to share as who knows where this world and my no plan-plan will take me next?! Taking it all one day at a time. Stay tuned.